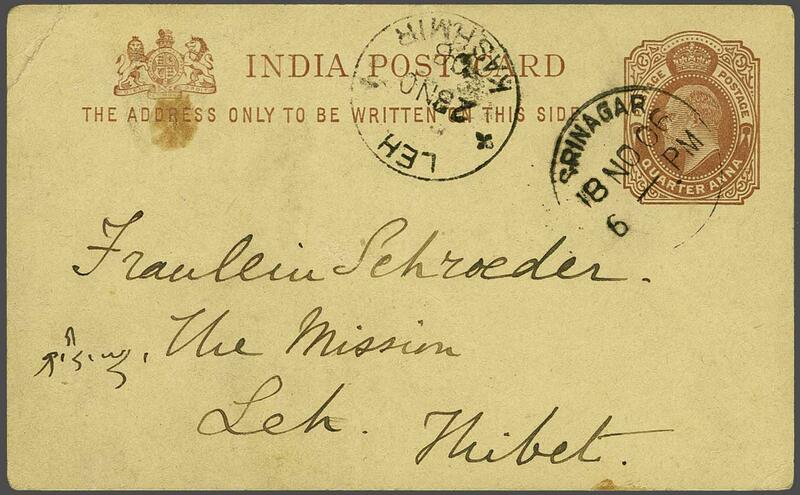 1906: India ¼ a. brown on buff postal stationery card mailed from Srinigar to a 'Fraulein Schroeder, The Mission, Leh, Thibet' cancelled by 'Kashmir' cds (Nov 18) with bold (and scarce) LEH / KASHMIR arrival cds (Nov 23) alongside both struck in black. Interesting message on reverse "your luggage has reached Srinigar so perhaps you might get it before the road is closed by snow. You will have a long quiet time for study during the winter...". Corner bend to card but very scarce.